If you have sensitive skin or a nickel allergy, it can be difficult to know where to buy titanium earrings. Luckily, here at Blomdahl, we offer so much more than standard medical grade jewelry. Our exquisite collection includes dazzling dangle earrings, Swarovski crystal studs, stem and post earrings, and much more! Whether you’re looking for a pair of everyday earrings or some unique studs to complement an outfit, we have everything you need to build your skin-friendly jewelry collection. Our black, silver and gold earrings with titanium posts will suit every style while still protecting the body’s most delicate organ: the skin. Skin sensitivity is especially prevalent in children, which is why our collection of earrings for children, toddlers and babies is so popular. Parents can make their little one's dreams of wearing earrings come true without compromising their health or safety. Rest assured that every care is taken throughout the manufacturing, handling, packaging and shipping process to ensure our earrings remain skin-friendly for those of all ages. To protect your skin and health, we use pure medical grade titanium on the parts of the earring that come into contact with your skin. The portion of the jewelry that does not come into contact is covered with a skin-friendly coating made from high-quality stainless steel. 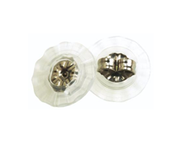 We also provide titanium or plastic stoppers, so you can continue to wear your skin-safe earrings even if you lose the backs. The care and attention we give our earrings means that both adults and children can wear Blomdahl jewelry every day without having to worry about their skin. Stay in Touch and Get 10% Off Your Next Purchase! Please check your inbox / spam folder to confirm your email.